Last week saw the passing of filmmaker Chris Marker. I’m not that familiar with his work, unfortunately, but what I have seen I found touching on a kind of “pure cinema” level, where the elements of film come together to create something unique to the medium, achieving the kind of lyrical no so che that happens way too rarely in cinema. Very different, to be sure, but similar to the best moments of Andrei Tarkovsky’s work. 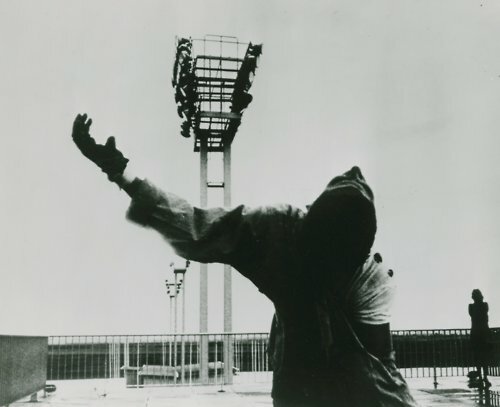 Incredibly, Marker does this in what is essentially a slide show — his most famous work, La Jetée (1962). And I don’t just mean the breathtaking moment when it slips into actual film, but the writing of the voiceover, which almost hypnotically evokes the sense one sometimes gets when dreaming, of displacement into a different, possible life. And the incredible still toward the end of the protagonist getting shot at the airport jetty — it takes longer than the still remains on screen quite to figure out what one sees. A take on the Grim Reaper, it’s a shocking representation of the event of death the like of which I do not recall having seen in any other film. Forget The Seventh Seal. And I love the way Marker captures one of my favourite directors, Kurosawa Akira, directing Nakadai Tatsuya and the cast of his late masterpiece Ran in the black sands of Mount Fuji in the documentary A.K. (1985). A picture of severe concentration, as oppressive as the work environment. And then there’s the opening sequence of Le Fond de l’Air est Rouge (1977), his documentary on the global left 1967–77, a film I have yet to see in its entirety. Athough one might argue that he veers into agitprop, there is something about the way he interweaves the Odessa sequences of Eisenstein’s Battleship Potemkin with images of the Vietnam protests to the tune of Luciano Bério’s rousing music that conveys the optimism and outrage of that particular moment in history like few other works of art. It helps make somebody like me, who was born after and never really understood the revolutionary belief of the sixties left, get what was happening.